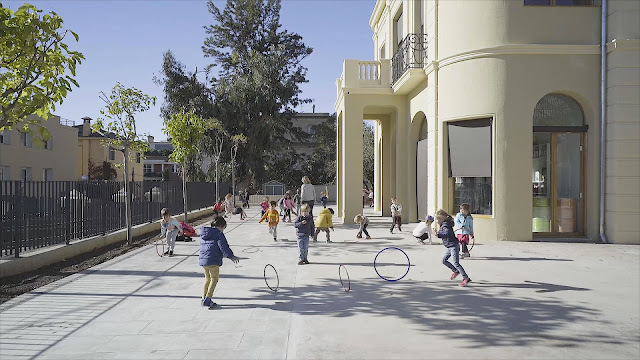 The video “One day at the school” from Building Pictures about the project Maternelle du Lycée Français in Barcelona, from the architects b720 Fermín Vázquez, invite us to join the daily routine of this school. 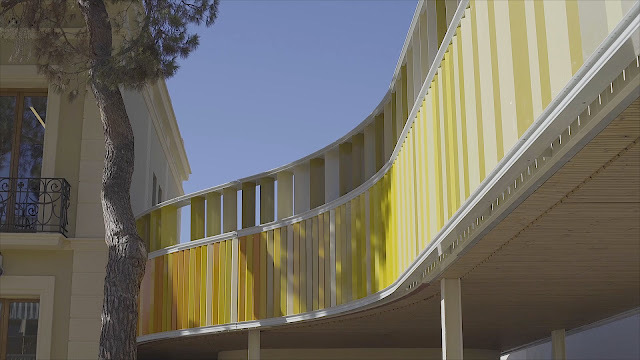 The project is the result the rehabilitation of a building (where the school administration works) and the construction of a new one with colorful metal panels where classrooms, canteen, gym and dormitories are placed. In between the empty spaces of these two, there are plenty of playful areas with great permeability within the classrooms. The film highlights the way that kids own the space for their continuous movement and relaxed mood towards the camera, not even concerned by it. Because of that, the story is told mostly with fixed shoots and time lapses. The building of the school was the result of the addition of a series of temporary buildings over many years around two villas of the early twentieth century. After a careful analysis of all the possible intervention options, it is proposed to create a new building, efficient, representative and impeccably functional, and maintain one of the preexisting villas (the other one was in a much worse state of conservation). The new set proposes a dialogue between the historical school and that of the future. A visual and programmatic relationship is established between both buildings, through a porch that allows indoor communication between them and a space under which to shelter in case of rain. The formal resolution of the new building evokes, through the rounding of its corners, the volumetry of the villas, establishing a formal relationship without necessarily subordinating itself to a historicist imitation. The scheme of a large central courtyard of games and perimeter spaces is maintained. The new building is developed in four levels. A semi-basement level that takes advantage of the unevenness between the garden (playground) and the street, to create a direct access, partially covered, and an outside waiting area for parents and children. From this you can access the interior of the new building and, externally, the garden by stairs and ramp. In the three upper levels the classrooms are located. Each height of the building is intended for a school level. 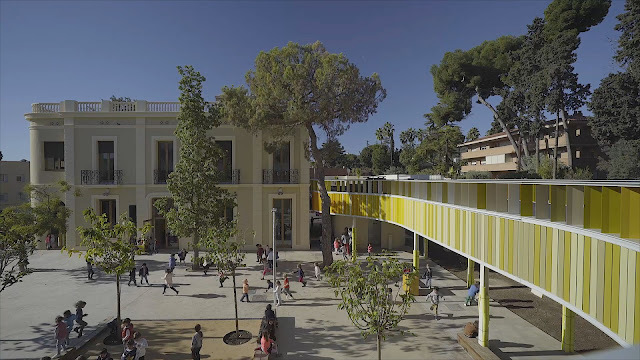 The proposal locates all the classrooms in the new building, leaving in the old building preserved and restored common uses: media library, music room and administration areas. The image of the facade is given by an envelope of vertical slats that run along the entire perimeter of the building. The position, orientation and separation of these slats has been studied to provide optimum solar protection, and highly efficient in their environmental, thermal and durability behavior. The chromatic and proportional game is the result of a fruitful and continuous dialogue with the client who from the beginning wanted to include the color in the project.